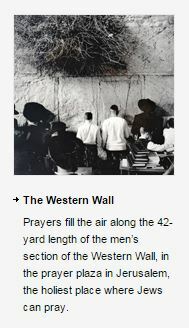 Following communication with CAMERA’s Israel office, National Geographic has corrected a caption which erroneously identified the Western Wall as Judaism’s holiest site. “Blessed. Cursed. 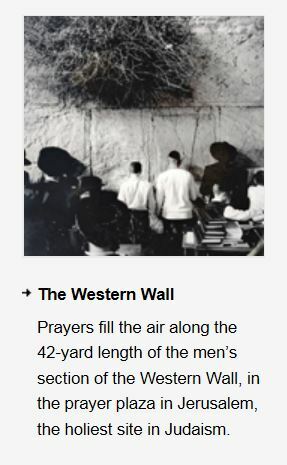 Claimed.” pages 104-05: The wall visible in the photographs is the holiest place where Jews can pray; some consider Judaism’s holiest site to be the Temple Mount, which was not pictured. While this formulation is an improvement over the original caption which wrongly identified the Western Wall as Judaism’s holiest site, the assertion that “some consider Judaism’s holiest site to be the Temple Mount” is puzzling. Jewish religious sources and authorities consider the Temple Mount Judaism’s holiest site. What else counts? The stones are all that’s left of the Second Jewish Temple, destroyed by the Romans in A.D. 70. In fact, the Western Wall stones were not a part of the Temple. They were part of the retaining wall of the Temple Mount compound upon which the Temples stood. Nor are they the only remainders of the Temple Mount compound. The southern, eastern, and northern retaining walls are also still extant. Surviving features abutting the southern walls include a broad stairway leading up to the Temple Mount’s entrance and two gates, known as the Huldah Gates, which provided access to the Temple Mount (Hershel Shanks, Jerusalem: An Archaeological Biography, p. 143). Some of the interior part of the Herodian Double Gate (which is one of the Huldah Gates) is also still intact. There are also surviving underground remnants of the Temple complex, including the area known as Solomon’s Stables. In addition, an area called “Robinson’s Arch,” in the south-western corner of the Temple complex, still remains. In his book, Shanks provides details concerning numerous other remnants. Western Wall–An article in Monday’s Section A about a visit to Jerusalem by pop star Madonna described the Western Wall in the Old City as the sole remnant of Jews’ Second Temple. It is the principal remnant of the temple complex accessible to worshipers, but other archeological elements survive.